I am Wendy Li, my Chinese name is Li Tao, I come from Chengdu. After learning Positive Discipline, I've become a better mom, and a better self. This picture shows my four-year-old daughter carefully taking notes during our first family meeting. Of cause she didn't know what to write at all. Our first family meeting was very funny so I wrote a blog about it. My daughter imitated me to make notes and also offered topics for discussion, like, "Mum's getting angry, giving birth to a baby sister or brother." I was so amazed that she enjoyed the family meeting so much. Yesterday, on the Monday night, we held our first family meeting. Days before, I told Tiao tiao we would have our first family meeting several days later, which means Dad, Mom, and Tiao tiao are going to sit together to have a meeting discussing family issues. Not knowing how much she understood, she seemed excited, and showed her happiness for this family meeting. Yesterday, I mentioned we were going to have the meeting after dinner and I asked if she had anything that needed to be discussed. She answered seriously that she wanted to keep a bunny and a puppy in the house. Actually, Tiao tiao has asked for this many times, but I always told her that I needed to discuss it with Dad first and then we’d decide. Anyway, this is indeed a proper proposal for a family meeting. I took out a pen and a notebook and prepared to take notes. Tiao tiao wanted it too, so I gave her a small notebook and a colored pen. We all sat around the table, the meeting was about to begin. First we gave thanks to each other. This made me a little bit excited immediately. Dad thanked me for doing the laundry, and thanked Tiao tiao for being good. I thanked Dad for helping me wash the dishes, and thanked Tiao tiao for sharing her tofu with me during the dinner. This was the first time for our family to do this kind of activity, so there were still some embarrassed feelings. Tiao tiao was watching Dad and me with awkward smiles on her face while we were speaking. When it was Tiao tiao’s turn, she imitated us. She thanked me for washing her clothes and said, "Dear Mom, I love you. Dad, I love you, you are so cute." I was surprised, and also deeply moved to cry. Tiao tiao said, ”I want a sister!” Maybe she forgot her wish about having a pet before, or, maybe she just found out this topic was more important. I said softly, ”Well, Dad and Mom are considering it.” And Tiao tiao accepted this with silence. Then, I proposed about the candy that Tiao tiao should only eat at weekends and just one at a time. Tiao tiao said yes quickly. So I said, "Well, I’m going to write it down now." 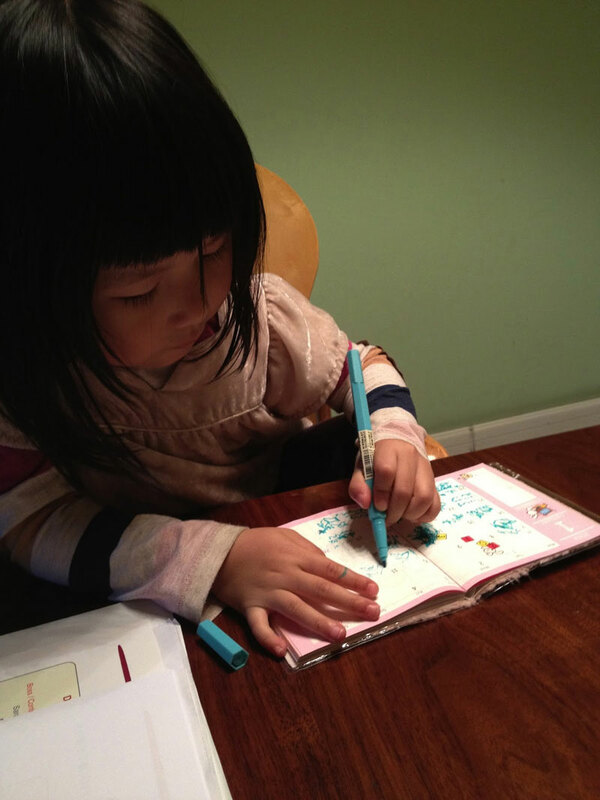 Seeing me, Tiao tiao was doing the same thing on her notebook. Then, Tiao tiao unexpectedly proposed a second proposal. She imitated me and said, "About Mom being angry, can Mom don’t get mad? You can say please don’t do this and say it softly." Tiao tiao added. Her voice was so soft and so gentle and said, "Then Tiao tiao will understand and won’t do it anymore." I agreed of course. She said again, "Tiao tiao cry when Mom yell, I’ll get it if you tell me softly." Then I said I would write it down. I repeated what she said while I was writing. Tiao tiao wrote too while saying, "Tiao tiao has written a lot of words, I, love, you, dear, dad, mom, thanks for dinner." Later, I thought we should also make a proposal about Dad that he should come to meal when I finish cooking so we three could eat together. Tiao tiao imitated me again, and said, "So I’ll write it down." After that, I asked was there anything else to be discussed. Tiao tiao said on her own, "About the bath, can Dad and Mom wash Tiao tiao’s hair softly when taking a shower?" I said yes and wrote it down. When the meeting was over, Tiao tiao was not willing to leave the table, and she was still drawing on her book. I took a look at it, there were many squares on it, Tiao tiao was really writing words on it, she drew many curves in each square, and every curve stayed perfectly in the square. And that’s different from her usual paintings. This picture will be printed and I will paste it on the book of our family meeting record. That’ll be really nice memory! The meeting is over, and I think it’s very meaningful. I thought of some other things that can be talked about after our first family meeting. And I am really looking forward to the next one. All parents who take part in learning the courses of Positive Discipline will find out family meetings are so worthy. And I’m one of them. There are different reasons why I haven’t held it till yesterday. First, Tiao tiao didn’t reach 4 before, second, we usually take activities outside at weekends, and we arrive home late. I always worry about our living pattern is not good for keeping family meetings. Last thing is I never attended any family meetings before, so I don’t know whether I can do it. On the other hand, for Chinese family, to hold a democratic meeting like this is still awkward. Now, we did it. I think I should do this earlier because I do love it, and since we do it on Monday night, it helps a lot for us to persist, because we are usually free at this time. In addition, comparing with us, Tiao tiao adapts this democratic life best.